Das ist es also nun! Das von vielen mit Ungeduld erwartete Update zu Black Ops 4, ist nun auf allen Plattformen verfügbar. Die Größe des Updates, variiert zwischen den verschiedenen Plattformen. Auf der PlayStation 4 beträgt das Update rund 8,9 GB. Die PC Variante schlägt lediglich run 4 GB zu buche, während das Xbox One Update, mit 11 GB den meisten Platz auf der Festplatte benötigt. Zudem erhalten PlayStation 4 Besitzer, den neuen Schwarzmarkt für Call of Duty: Black Ops 4. PC und Xbox One, folgen dann eine Woche später. Welche Änderungen das Update mit sich bringt und auf welche Neuerungen ihr euch freuen dürft, könnt ihr in den unten stehende Zeilen nachlesen. Starting today for PS4 players, the Black Market is back! In Black Ops 4, we’re giving players more choices than ever before with the Contraband progression path to earn free cosmetic items as you play, including new Tags, Gestures, Outfits, Calling Cards, Stickers, Blackout characters, Signature Weapons, and more. As you unlock these cosmetics by playing the game, you’ll earn more ways to express yourself than ever in both Multiplayer and Blackout. Operation: First Strike kicks off the first season of Contraband content in the Black Market on PS4 today. Also, starting tomorrow on PS4, players will get access to a free Halloween-themed Special Event stream with even more seasonal gear to earn! Both the first season of Contraband content in the Black Market and the Halloween Event will begin on other platforms one week later. Note: While start and end dates may vary by platform, limited-time Special Events like the Halloween Event will all run for the same duration for all platforms – this will allow all players the same amount of time to experience the content. Timing on updates to the game including bug fixes and other improvements will not be affected. Get more details on what the Black Market includes and how it works at the blog here. 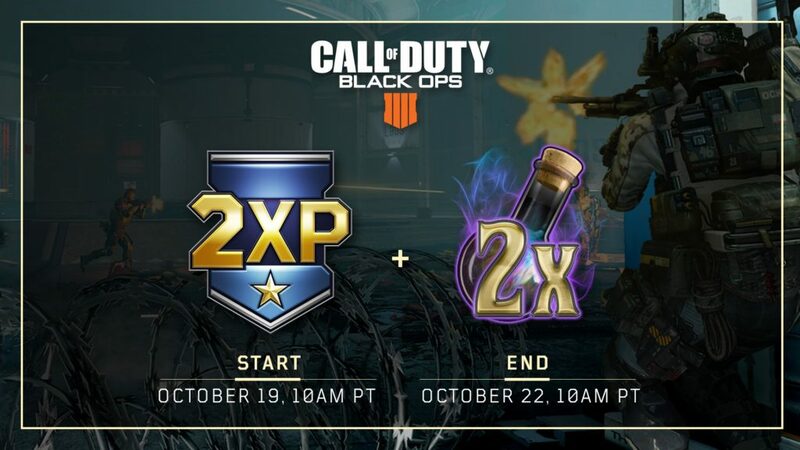 We’re also starting the weekend right with our first 2XP event, giving players on all platforms 2XP in Multiplayer and 2X Nebulium Plasma in Zombies through 10AM PT on Monday, October 22nd. Hope you’ve cleared your calendar. Tja und trotzdem. Wenn man im blackout modus sich verschanzt in einem engen raum und will seinem partner etwas droppen muss man aufpassen das genug platz auf dem boden ist. Sonst ist es weg und keiner hat was davon.